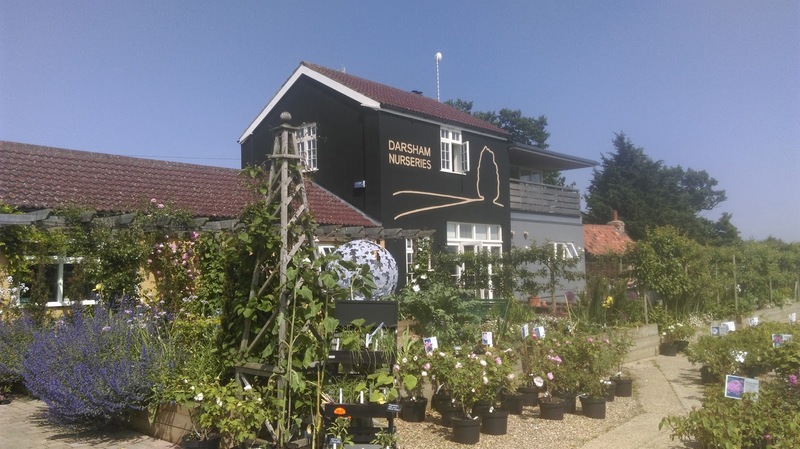 The cafe at Darsham Nurseries is what every garden centre ever visited is crying out for. 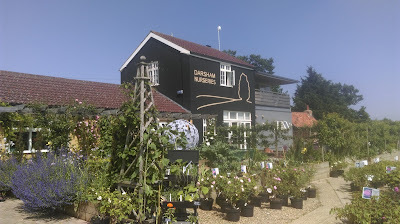 Like the beautiful nurseries in which it sits, the cafe is no ordinary lunch spot - although one would be forgiven for assuming it might be, given its location directly off the A12 by Darsham's level crossing. 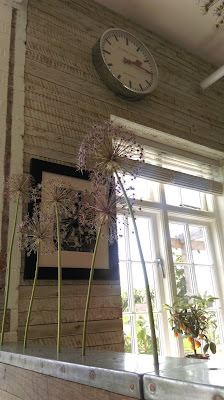 The cafe is, in fact, a delightful space that feels like the heart of Darsham Nurseries; a very special place creating very special plates of food. We were there for a weekday lunch. As is the way these days, we'd skimmed over the sample menu online and promptly made a reservation. 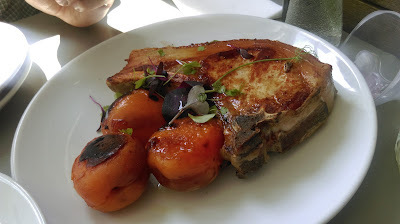 The list of simple, seasonal dishes gave big hints that the cafe was right up our street. The menu is presented as a selection of small plates ordered into vegetables, meat and fish, snacks and breads, and sweets. Every line of the menu, every perfect combination of ingredients, competed for our attention. We wanted to dive into every single one of the nine vegetable plates on offer, drawing us in with the promise of grilled asparagus with romesco, broad beans and buckwheat, braised leeks with butter beans, and other treats from the kitchen garden. Seven solid meat and fish plates caught us off guard: we wanted the hanger steak with fermented tomato and capers, the cured lamb fillet and fennel, the whole mackerel with blistered tomatoes. On the side we had our eyes on Pump Street Bakery sourdough, radishes and Maldon salt, and yoghurt flatbread. We wanted it all. Choosing was tough, but dissecting and devouring a menu like this is surely the best kind of agony. 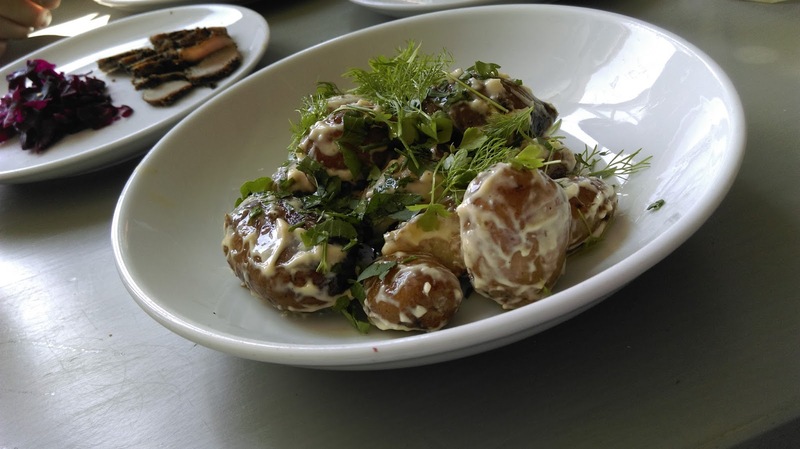 The food menu recommended sharing a selection of the small plates, suggesting two to three per person would suffice. We'd already ordered three plates from the vegetable list when we realised we were going to go big. Three meat and fish options rolled off the tongue before the waiter could even get his notepad out. Exercising restraint (a little too late) we added just one order of sourdough bread and butter to nibble on. The drinks list had our mouths watering too. 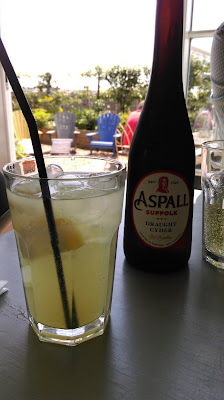 Glasses of crisp, chilled cider from Aspall and tart homemade lemon cordial were spot on, sipped whilst looking out over the sunny terrace and the vibrant green nursery plants beyond. When the food began to arrive, we really got stuck in. Every plate looked as perfect as it tasted. Each dish arrived as triumphant and satisfying as the last. Jersey royal potatoes with aioli (£4) were a joy to wolf down, huge forkful at a time, slightly warm and smothered in plenty of herb-flecked sauce. Garden greens (£4) topped with goat curd were full of honest earthy flavours. 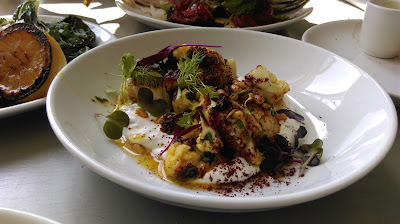 A real highlight was the bowl of spiced, roasted cauliflower (£8), the humble veg made decadent by its bed of rich yoghurt and swirls of saffron butter. We chose equally well from the list of meat and fish. 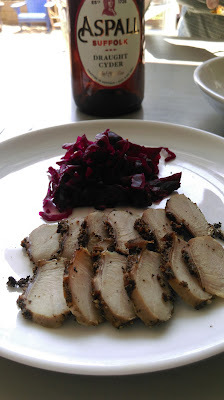 A generous plate of rabbit pastrami (£6) easily fed two, and the spicy crust had us licking our lips for more of the addictive hit of pepper/spice/juniper (although its partner of red sauerkraut was a little redundant). The much-anticipated whole roast mackerel (£11) was the star of a successful summer's day lunch: deliciously crisped skin, perfectly cooked flesh inside, blackened tomatoes bursting with flavour. Last to arrive, the Blythburgh pork chop (£10) was a beautiful beast with a huge wedge of slightly crisped fat which was heavenly with the burnt apricots alongside, but could have done with more colour and perhaps a longer rest. 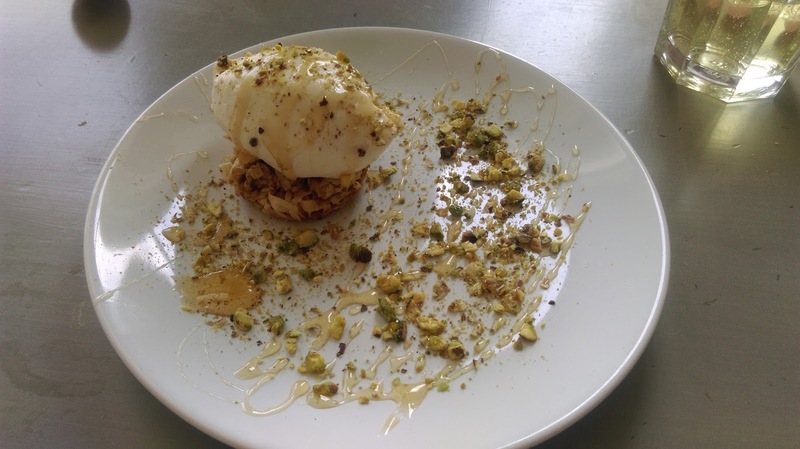 With little room to spare, we reasoned that the menu's list of sweets would be appropriately sized small plates too, given the price tags (ranging from £1.50 per scoop of ice cream to £5 for a more substantial dessert) and couldn't resist trying yet more of this chef's cooking. A perfect pot of salted chocolate and olive oil mousse (£4) was too good to pass up and had a pleasing savoury edge and a refreshing topping of creme fraiche that cut right through the richness. The feta and honey cheesecake (£5) was the prettiest plate of all, scattered with crushed pistachio, drizzled with honey, and topped with its crowning glory, the ball of light and airy whipped feta. Our long lunch over, the cafe was emptying, the chatter of customers subsided, and the industry in the kitchen - punctuated only by efficient, sing-song shouts of 'service' - faded away. 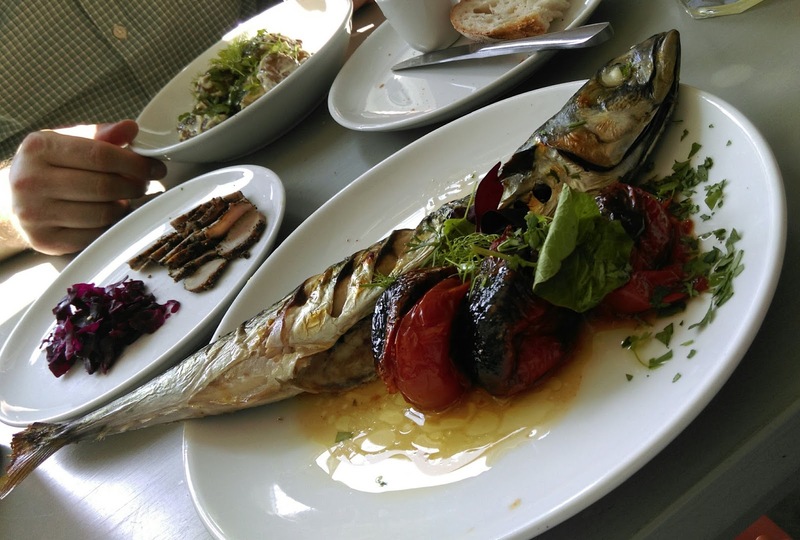 We left happy, well fed, and vowing to return to sample another season's list of all that's good in Suffolk.  For this is the place to get it.